Recently listed PNG financial institution, Kina Securities Ltd (ASX:KSL, POMSox: KSL) has successfully completed the acquisition of PNG's fourth largest bank, Maybank PNG, creating a new, dynamic and diversified financial services provider for the nation. Kina has acquired the business from Malayan Banking Berhad (Maybank Group), in accordance with the timetable outlined in the prospectus for Kina's A$97 million initial public offering, completed in July 2015. The acquisition will enhance Kina's established position as a leading funds management and financial services institution in PNG, providing Kina with a banking licence, a substantial lending and deposit business, access to new markets and significant operating synergies and cross-sell opportunities. • the leading stockbroking company in PNG. The acquisition was completed for a purchase price of K353 million (A$173 million). and partly in US dollars. The vendor therefore will assume currency risk, and Kina has agreed to progressively exchange the PGK for USD at market rates over the next 12 months. year ended 31 December 2015. Prime Ministers of Papua New Guinea and Australia discussed a range of issues of mutual interest including climate change, development support and APEC preparations, during their meeting in Sydney on the eve of the NRL grand final. This was the first meeting since Malcolm Turnbull was elected as the Australian leader, and Papua New Guinea's Prime Minister, Peter O'Neill, said he was confident the relationship between the two countries would continue to go from strength-to-strength. "I congratulated Malcolm Turnbull on his election as the Prime Minister of Australia and look forward to working closely with him and his Government in furthering our relations," O'Neill said. "We discussed issues relating to climate change, particularly the recent Declaration by the Pacific Islands Forum Leaders. "Mr Turnbull expressed his support and agreed that Australia should provide leadership and support on climate change issues. "This is particularly important considering the gravity of the climate change in the way it affects to many of the smaller island countries. "The upcoming COP-21 meeting in Paris is an important forum and Australia will actively participate in this discussion." The two prime ministers also discussed the review of advisory and technical assistance provided by Australia. "Our intention remains to change foreign advisory roles to become contract positions. "This will achieve greater accountability and value for both countries. "We anticipate that by December this year that these advisory roles will be converted to line positions, including the Policing Program with the Australian Federal Police." 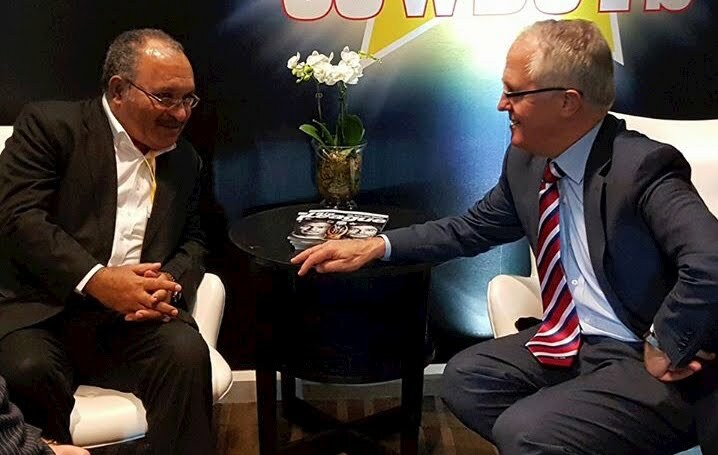 O'Neill said his Australian counterpart was very well briefed on economics and politics in Papua New Guinea and acknowledged the National Government's work to deliver progress and development around the country. Turnbull also offered his ongoing support to PM O'Neill's Chairmanship of the Pacific Islands Forum over the following year, and for Australia's support to Papua New Guinea in hosting APEC the Leaders' Summit in 2018. "We are advancing our preparations to host APEC in 2018 and Australia will be an essential security partner as we welcome the Asia-Pacific leaders to Papua New Guinea." 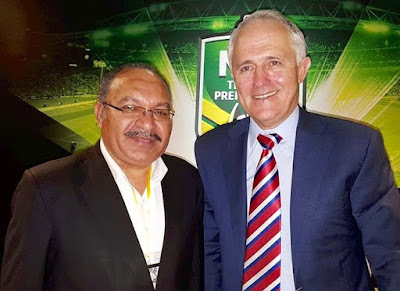 O'Neill invited Prime Minister Turnbull to visit Papua New Guinea at a time of his convenience and he agreed to do so. Prime Minister Peter O'Neill has welcomed the European Union's lifting the 'yellow card' warning on Papua New Guinea's tuna exports. Speaking after the EU announced the change, O'Neill said the Government would continue to work with the fisheries sector to improve monitoring and enforcement. "Illegal fishing and not reporting full catch amounts costs the people of Pacific island nations an enormous amount of money and undermines the sustainability of fish stocks," he said. "Papua New Guinea is committed to ensuring we have full control of our fisheries and fighting those who would seek to illegally exploit our resources. "Our fisheries sector has to last generations into the future and through coordinated monitoring and planning this will be the case." O'Neill said coordination between Papua New Guinea's security agencies and industry stakeholders would continue to improve monitoring and enforcement. "The European Union recognises the effort that is being made in Papua New Guinea to prevent the illegal removal of fish stocks and we will continue to strengthen these measures. "We appreciate the concern that the European Union has for ensuring the sustainability of fish stocks, not only in Papua New Guinea but around the world. "Global demand for fisheries products will only continue to rise in the coming years, so now is the time to be proactive and ensure monitoring and enforcement." O'Neill said Pacific Islands Forum Leaders had continued to place a priority on ensuring proper management of marine resources, and this was reaffirmed at the recent Forum meeting in Port Moresby that he chaired. "Forum Leaders have tasked fisheries, economic and foreign Ministers to undertake a joint comprehensive evaluation of systems currently in place. This includes regional monitoring, control and surveillance, and compliance regimes, and to report back on their findings in 2016." O'Neill said the report would pay special attention to the use of modern information and communications technologies that can be deployed for fisheries surveillance. Prime Minister's Chief of Staff Isaac Lupari has highlighted the inconsistencies and "cheap shots" in recent statements by the Leader of the Opposition in relation to the Prime Minister's travel, and economic developments. "Don Polye is misleading the people and country with his recent statements," Lupari said. "This is wild goose chase rhetoric from a man who has not offered any real policy debate since he toppled Namah to become the Opposition Leader. "His continuous negative attitude is an indicative of someone with a vendetta and a bitter mindset. "This is dangerous for the country, and he should seriously consider whether he is worthy of being the alternative Prime Minister of the country." Following Polye's questioning of the Prime Minister traveling overseas for State business, Lupari said the Opposition Leaders' comments were inappropriate. "Don Polye should know better, as former senior minister and chairman of the World Bank and IMF, that the Prime Minister, by virtue of his position, is mandated to conduct state businesses in the country and outside of the country. "We live in a global community and Papua New Guinea has to engage with the international community both at government and business levels. "What Don Polye is saying is that Papua New Guinea should not engage with the rest of the world. "His isolationist policy would spell disaster for the country and our people. "It is rather sad for people like Don Polye to live outside of the real world." Lupari further questioned the Opposition Leader's ongoing negative commentary about the State loan to purchase Oil Search shares. "The UBS loan was undertaken for the State of Papua New Guinea to acquire 10.2 % shares in Oil Search Limited. "This matter is still before the Court and with the Ombudsman Commission, so it is improper for the Prime Minister to comment on it. "The Opposition Leader and those who continue to dwell breathlessly on this issue, must respect our legal system and Judiciary processes. "Polye and his cohorts should simply wait for the outcome of these proceedings. "Don Polye should get his facts right when he wants to make statement regarding the economy and Government's Finance. "He keeps misfiring on all fronts, which can only affect the image of the country. "This Government is trying its best to attract foreign investments into the country and it does not help, when people like Don Polye make misleading comments about the state of the economy. "This only goes to show that either he lacks real understanding of the dynamics of the economy and finance or he is simply playing politics." Lupari said the Prime Minister had already issued a statement on the royalty and development levy due to the landowners and provincial governments. "These funds were kept in the trust accounts with the Bank of Papua New Guinea and will be released to the landowners and provincial governments after landowner identification process was completed. "None of these funds are used by Government for budgetary purposes. "If Don Polye is concerned, all he has to do is ask the Governor of the Bank of Papua New Guinea. "It appears his statement is another reflection on misunderstanding and inability to debate policy issues. "What the Prime Minister has said on the issue of LNG revenue was very clear. "First, that PNG LNG project revenues are being affected by the decline in the Oil price. "Therefore revenue inflow to the State will be less than what was expected in the Budget. "That is a fact, and it is truth. 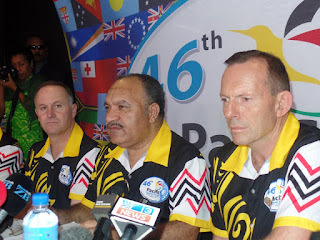 PNG has no influence over the oil price on the world stage, and therefore we have to adjust to reflect this. "That is why Treasurer will tabled a supplementary budget in the October-November Parliament Sitting. "Secondly, the Prime Minister issued an statement on the issue of royalties for landowner and provincial governments, and a development levy for LNG provinces from the LNG Project. "This was following questions about the whereabouts of these funds which were raised by landowners and others. "The Prime Minister has confirmed that all royalty and development payments are keep in the Trust Account with the Bank of Papua New Guinea for safe keeping until the landowner identification process was completed. "Also, none of the above funds have been or are going to be used for budget purposes. "If Don Polye wants to know the truth, he should simply ask the Governor of Bank of Papua New Guinea, instead of lying to the people of Papua New Guinea. "This Government is all about growing the economy, creating employment for our people, and stimulating the growth of the private sector development and delivery basis services to our people. "The Government is not interested in playing nonsense politics with people like who are bereft of ideas and just want to talk the country down for their own gain. "If Don Polye is so concern about the welfare of the people, he should start attending to his people of Kandep, whom he has neglected for so long." Opposition Leader Don Polye has questioned Prime Minister Peter O’Neill’s "secret trip" to Singapore. 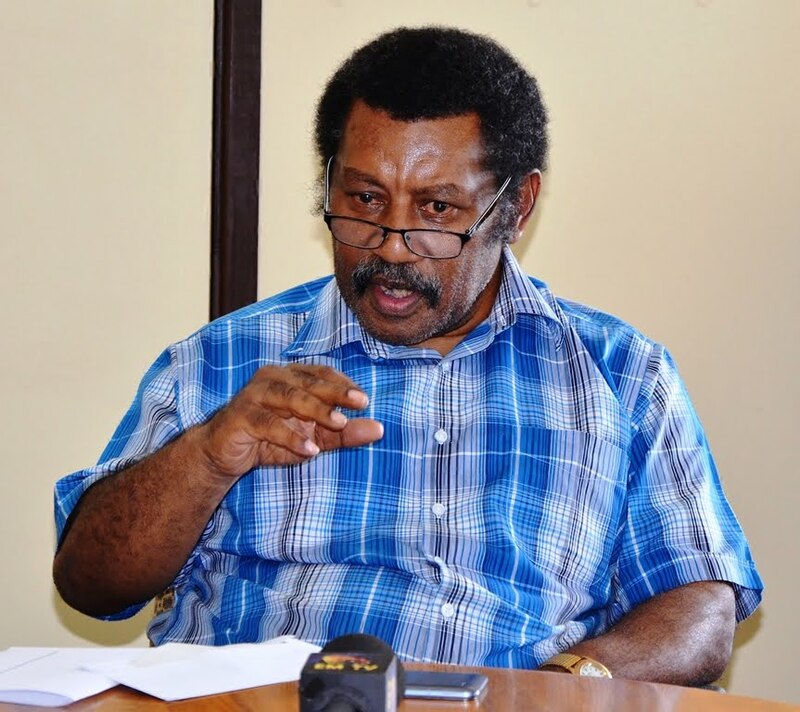 Polye queried why O’Neill quietly slipped out of the country without even officially appointing an acting Prime Minister. “Why has O’Neill accompanied by selected cabinet ministers left quietly for Singapore?” asked Polye. The Opposition Leader believes O’Neill is in a hurry to secure an additional loan to burden the country. "The departure of O’Neill comes at a time when Bank of PNG has come out clear telling the country that proceeds of LNG is not kept in a trust account. "Prime Minister Peter O’Neill previously said the proceeds were kept safe in a trust account within the bank. "BPNG Governor Loi Bakani announced that LNG revenue is not kept by the Bank." Following Bakani’s explanation, the Opposition Leader commended Bakani for coming out with the truth. 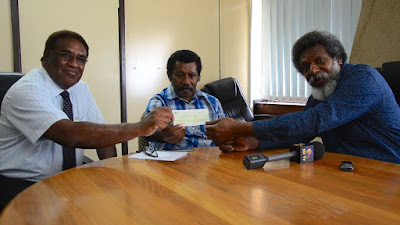 “Mr Bakani’s explanation directly tells us that O’Neill has been telling lies to the landowners that their money is being kept at the trust account at BPNG,” said Polye. He said over 120 LNG shipments had been made and this should bring in over K4.8 billon in revenue. Polye reiterated his earlier comments that he had classified information that proceeds from LNG were kept in a ESCRO account operated by the UBS to pay off the K3 billion loan O’Neill has obtained from them. Polye said proceeds of LNG were mortgaged to pay off the K3 billion UBS loan obtained by the O’Neill government. He said nationally owned company NPCP acted for the government in ensuring that proceeds from the LNG go straight to an account in Singapore. "NPCP on behalf of the state signed a payment direction deed in 2014. "The deed signed allowed the establishment of Escrow account in its own name with UBS in Singapore. "As per the payment direction deed, all proceeds will go to a withholding company, GloCO which then services the UBS loan. GloCO is then paid for its services all from the proceeds of PNG LNG." 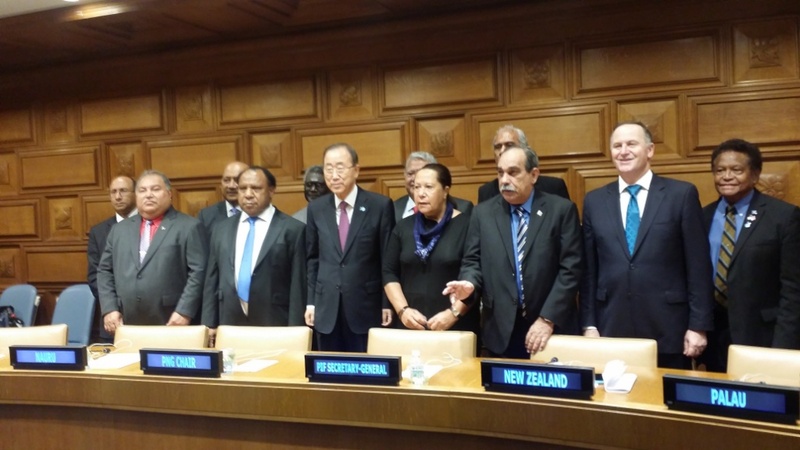 Pacific Island Forum Leaders with the Secretary-General of the United Nations, Ban ki-moon. Papua New Guinea's Minister for Foreign Affairs and Immigration, Rimbink Pato, has conveyed Pacific Island State concerns and sought support from the United States on issues such as climate change. Representing Prime Minister Peter O'Neill, Pato raised the issues at a meeting of Pacific Islands Forum (PIF) Leaders with the United States Assistant Secretary of State, Danny Russell in New York last Friday. Pato further expressed his desire for United States' backing at the COP21 Conference in Paris this year on climate issues that were of vital significance to lives and communities in the Pacific. "The United States is aware of the threat brought about by climate change and extreme weather in the Pacific. "Assistant Secretary Russell expressed his concern at the devastation caused by tropical storms in Samoa, Solomon Islands and Vanuatu and the need for concerted efforts at all levels to assist small island countries in mitigation and resilience efforts. "He further informed the meeting that whilst the US Administration wished to do more, the political dynamics in Washington does not always help the Administration's desire in this regard. "We appreciated Assistant Secretary Russell's concern for the issues affecting our region and the broader global community, as well as the difficulty faced in gaining bipartisan support in the United States Capital." Pato said Russell and his team received a briefing on the Pacific Regionalism framework endorsed by the recent PIF Leaders' meeting. "Areas such as fisheries, climate change, cervical cancer and West Papua, that are covered in the Pacific Regionalism Framework, truly capture the concerns and aspirations of the people of the Pacific. "Assistant Secretary Russell made the point that the United States is a Pacific State and hence appreciates the need for solidarity with the PIF countries in advancing issues of common concern. "On the nuclear weapons issue, Pacific Leaders have urged the United States to ratify the Treaty of Raratonga as well as find just solutions for the people of Marshall Islands as a consequence of nuclear tests in the region. Russell congratulated Papua New Guinea for successfully hosting the 45th PIF Forum, and a copy of the PIF Leaders Joint-Communique was given to the United States contingent. Pato thanked the United States contingent, that also included the United States Ambassador to the United Nations, Ms Samantha Power, and other high ranking officials for hosting the meeting with the PIF Leaders. 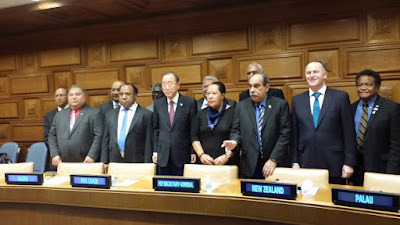 While in New York to attend the United Nations General Assembly Meeting, Pato also chaired a meeting between the Pacific Island Forum Leaders with the Secretary-General of the United Nations, Ban ki-moon. Chief Secretary to Government, Sir Manasupe Zurenuoc (pictured), has applauded the Special Agriculture & Business Leases (SABL) Implementation Taskforce, for the outstanding report to implement the recommendations found during the Commission of Inquiry into SABLs. This special taskforce is comprised of Dr Laurence Sause (Chair & Policy and Government Advisor) and two retired public servants Kutt Paonga (Legal advisor) and Daniel Katakumb (Land Advisor). Sir Manasupe said in 2011 the government set up a Commission of Inquiry into SABLs, which found that many leases needed to be revoked. He said the government then referred the matter to a ministerial committee to implement the findings of that particular inquiry. "However, the ministerial committee could not progress much for various reasons," Sir Manasupe said. He said towards the end of 2014, Cabinet set up a special taskforce – SABL Implementation Taskforce - under the Chief Secretary, to look at means and ways on how to effectively implement the COI findings. "Currently the laws are complicated and ineffective to revoke these leases therefore amendments to the legislation will be considered. "From the report provided by this special taskforce, the government now has a clear way to implement the revocation of non-genuine leases. "I commend the taskforce for a job well done in making it easier for the government to move forward," Sir Manasupe said. He said the taskforce had advised the government on how best to implement the findings of the COI. "Out of the 75 SABLs throughout the country, only 42 SABL reports were provided by only two members of the commission – Nicholas Mirou and John Numapo - who provided finding recommendations that 30 were to be cancelled, 11 to be suspended and that only one SABL was in order. "The other 30 SABL reports, however, have not been received by the government hence the government is now pursuing other actions to obtain them," Sir Manasupe said. He also announced that the report was now ready to go before Cabinet for approval. "In the not too distant future, the government hopes that some of the land will be returned to landowners," Sir Manasupe said. The National Government today received another K50 million in dividends from the National Fisheries Authority. This is on top of the first component of K25 million presented earlier to the government in August this year. The K50 million cheque was presented to the Chief Secretary to Government, Sir Manasupe Zurenuoc, by the NFA Chairman Job Pomat and Managing Director John Kasu, in Port Moresby. Sir Manasupe thanked NFA for its ongoing support to the government, saying the NFA board's commitment of providing increasing dividends to the government over the years contributed largely to the country's revenue cycle. He said the NFA was one of the few State-owned enterprises that continued to bring in increasing dividends every year. "The dividends like all other dividends will be put in to the government purse for the budget. "I would also like to applaud the National Fisheries Authority for its efforts in successfully meeting the European Union's requirements, which has resulted in the uplifting of the yellow flag restrictions on our fishing regulations," Sir Manasupe said. Pomat also revealed that NFA had just received a letter from the European Union that the yellow flag ban on fishing processes in PNG waters had been lifted. He said this was a proper opportunity to raise PNG's standards to be the first-class tuna provider in the world. Last year, NFA furnished a total of K50 million in dividends to the State compared to this year's K75 million. Prime Minister Peter O'Neill has raised serious concerns at the motive and intent of the complaint submitted by Sir Michael Somare to the Ombudsman Commission of Papua New Guinea. "The actions by Sir Michael Somare in submitting his recent complaint are self-serving and not in the best interests of the country," O'Neill said. "The events that took place in 2011 were because of Somare not being honest with the people of Papua New Guinea, and with the Parliament, about the seriousness of his illness and his lengthy absence as the Prime Minister of the country. "The position of Prime Minister of Papua New Guinea is not a birthright, it is a position that is mandated by the people though their Parliament. "It was in Parliament's considered view that Somare's lengthy absence of over eight months, without proper explanation or reason given to the Parliament, gave rise to a vacancy in the position. "This led to the events of 2011 when the Parliament elected a new Prime Minister." O'Neill said decisions of the court were noted by Parliament that acted within the law. "The Parliament, at all times took note of the court's decisions, and has dealt with these decisions appropriately. "Through Parliamentary process it was deemed that there was a vacancy, thereby allowing Parliament to conduct an election for the Prime Minister on each occasion. "Parliament has dealt with this within its mandate and the decisions of Parliament are not subject to the Leadership Code. "The people of this nation then went to the polls in 2012 where they elected our Government, and Somare must accept that the people made this decision through the ballot as part of our national democratic process. "He needs to respect the decision of the people and stop being a spoiler for the country. "If he thinks he has a case to present to the people, his opportunity will come again in 2017 within 20 months. "We will see him at the polls and this is where the people will decide again who should lead the country for the next five years." The Prime Minister said the State had been very generous towards Sir Michael Somare and it was time that he recognised the support that had been afforded to him. "All entitlements have been fully paid including additional funds he received from the State. "The people of Papua New Guinea do not owe him anything further than what he has already received." Deputy Prime Minister Chief Leo Dion led a Papua New Guinea delegation on behalf of the Prime Minister and the people of PNG to the 70th United Nations General Assembly Session at the United Nations Head quarter in New York, USA. 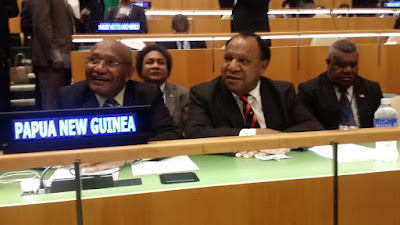 The PNG delegation comprised of the Minister for Foreign Affairs and Immigration and senior government officials from the Department of Prime Minister and NEC, Foreign Affairs, National Planning and Monitoring and officers from PNG's Permanent Mission to the United Nations in New York and the Embassy in Washington DC. Dion at the post-2015 summit addressed the United Nations General Assembly on the September 26, 2015, where world leaders adopted the Sustainable Development Goals (SDGs) to succeed the UN's Millennium Development Goals (MDGs) by January 2018. The gist of the Deputy Prime Minister's statement was on the National Government's initiatives to promote sustainable development in Papua New Guinea and issues on climate change, water, Health and Sanitation, Vision 2050, Long Term Development Plan and the National Strategy for Responsible Sustainable Development. 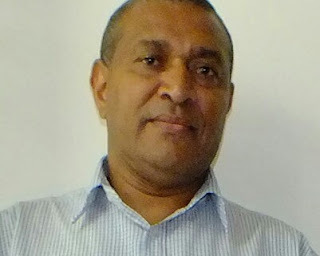 Dion said the drive by PNG to get international support on climate change also gained prominence when Pope Francis gave his speech on September 25, 2015. "The Pope talked about the same thing that the Prime Minister Peter O'Neill, has been emphasizing about on, climate change," he said. Dion said climate change was a real issue that was affecting thousands of lives in PNF and in the Pacific region. "PNG's contribution at the international level as Chair of the Pacific Islands Forum was our leadership in securing consensus among PIF countries in proposing SDG 14, which is to conserve and use the oceans, seas and marine resources in a sustainable manner. "Our leadership in proposing goal 14 underscores our commitment to ensure the international community recognizes the importance of protecting our pristine marine environment." He said this also underscored the 46th Pacific Islands Forum's commitment to work together. Dion went on to pledge PNG' support of the 17 Sustainable Development Goals and the country's commitment to achieving better results.